A large number of remarkably fortuitous federal employees are pretending to die… for monetary rewards! That is, they envision a different future to improve their prospects at a superior lifestyle during their retirement years. To gain an edge, these “abyss looking” individuals are using this little-used practice to assist them in making forward-looking preparations. Many feds today that are “killing it” are members of this exclusive group of perpetually successful individuals. Seems this distinctive type has always been around. Winners today also understand how preparation (i.e., planning, hard work, and research) meeting up with opportunity is still an excellent recipe for attaining one’s goals. To that end, some fortuitous feds go the extra mile to win at retirement. Even so far as to fake their own deaths! Think about your life today. Can you imagine your life without your spouse, your partner, your family? Now, try to take the emotion out of this exercise. Try to look at it from the admittedly colder, more calculated financial point of view. Imagine a future for your family, without you, using the same chilly approach! Are you the primary bread-winner? How would pensions and/or Social Security income change? Would their lifestyle take a hit if you weren’t around? Could they survive financially without you? Short-term? Long-Term? During retirement years? For some, this isn’t a comfortable or easy exercise. When this application is taken seriously and thought about in real-life terms, the images can be genuinely distressing and even discouraging. Yet, these types of questions are the foundation to the “Faking Death” game. No one has a magical crystal ball to know with full confidence what the future holds. Still, it is widely understood that life-changing events (either before or after retirement) can have a dramatic impact on ensuing retirement lifestyles. A wise design would insulate a retirement plan from as many potentially adverse events as possible. Marriage, childbirth, college, higher than expected inflation rates, relocating, changing jobs, and crippling accidents are all examples of life-changing events that can have a tremendous impact on retirement standard of living. But, none are likely as financially impactful as losing a spouse or life partner. We can’t know the future, but, we can make preparations that account for some common “worst case scenarios.” The Outlaws take steps in consideration for one of those worse cases: the death of a spouse. Clyde Outlaw and his wife, Bonnie (not their real names) are a married couple of 25 years. Clyde is a federal employee, Bonnie works outside the federal government. Friends would tell you, as a couple, the Outlaws seem to fit the typical definition of winners. Time after time, issue upon issue, they seem to regularly come out on top. They are in their late 50’s. Clyde has over 30 years of federal service and is covered under FERS. They recently confessed they have been faking their deaths as part of their retirement preparations for over 10 years. They have determined when they retire in less than a year, their fixed (average) expenses will be $5,400 per month. (Mortgage has been paid off). Clyde’s FERS pension (annuity) will be approximately $2,840 per month. Bonnie’s employer will provide her with a pension of approximately $3,260 per month. Note: Both received estimates from their respective HR departments. These estimates took into account FEHB withholding from Clyde’s pension, 10% reduction for a spousal benefit, along with estimated federal tax withholding. Fixed monthly income ($2,840 + $3,260 = $6,100) vs $5,400 fixed monthly expenses leave the Outlaws with an initial monthly cushion of $700 per month ($6,100 – $5,400 = $700). Based on Social Securities Administrations (SSA) “Quick Calculator” Clyde estimates his SSA “Full” benefit to be $2,677 per month (pre-tax). Using the same calculator, they estimate Bonnie’s “Full” SSA benefit to be $2,394. Combined, Bonnie and Clyde have approximately $1.1mm (Clyde – $750k, Bonnie – $350k) saved in their retirement accounts. The Outlaws fake Clyde’s death at least once per year. They assume he will pass in just one year from their calculations date. The following represents their most recent calculations. Clyde passes in one year – This would cause Bonnie to lose half of Clyde’s federal pension. Her early retirement income would decrease by $1,420 per month ($2,840 ÷ 2 + $1,420), taking Bonnie’s retirement income down to $4,680 ($6,100 – $1,420 = $4,680). So, their $700 per month joint cushion would convert to Bonnie’s individual $720 per month deficit ($5,400 – $4680 = $720). However, with Bonnie’s ability to qualify for Clyde’s full SSA income ($2,677) in approximately 8 years and her access to their retirement savings, Bonnie’s survivorship looks pretty good when faking Clyde’s death early in retirement. She would need to supplement her income with retirement savings of approximately $70k ($720 x 12 x 8 = $69,120) $70K is less than 6.4% of the total value of their retirement savings. Spread out over 8 years it is only .8% annually. They have estimated a conservative 4% annual growth, so her supplemental income could be furnished by her yearly earnings without the need to deplete their retirement principal. When Bonnie begins taking Clyde’s SSA income, her monthly deficit of $720 will turn into a monthly surplus of $1,957 ($2,677 – $720 = $1,957). Note: In one year Bonnie will be older than 59 ½ years old and not subject to 72(t) early withdrawal penalties. 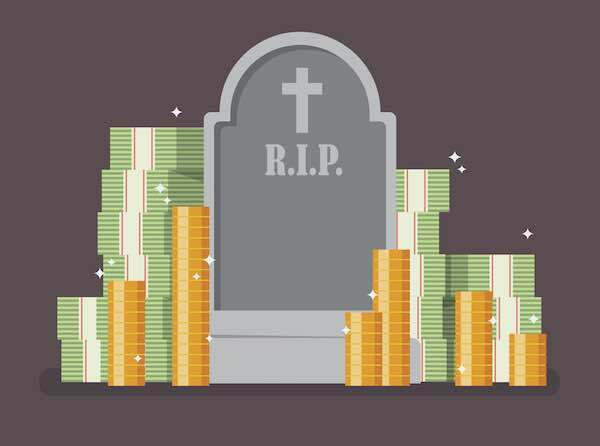 Playing dead is an excellent tool to use in preparing for and learning to survive retirement…Just don’t try it out on your insurance company first! Any opinions expressed in the article are those of the author alone. The opinions voiced in this material are for general information only and are not intended to provide specific advice or recommendations for any individual. Investing involves risks, including the loss of principal. No strategy assures success or protects against loss. Silverlight Financial, Infinity Financial Services and its affiliates do not provide tax, legal or accounting advice. This material is not intended to provide, and should not be relied on for tax, legal or accounting advice. You should consult your own tax, legal and accounting advisors before engaging in any transaction. For a list of states in which I am registered to do business, please visit www.silverlightfinancial.com. An Ounce of Current Prevention is Worth a Pound of Post-Retirement Cure! Are Feds Planning to Fail in Retirement?